Figure 1. 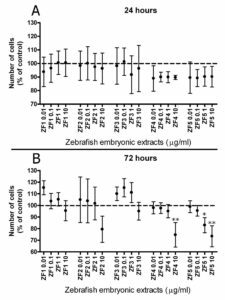 Comparative analysis of stem cell viability in the presence of early or late developmental stage zebrafish extracts. Cell viability was evaluated by MTT proliferation assay in control and hASCs exposed to ZF1, ZF2, ZF3, ZF4, and ZF5. Each stage related extract was given at the final concentrations of 0.01, 0.1, 1, and 10 μg/ml, for 24 hours (Panel A) or 72 hours (Panel B). Data are expressed as mean ± standard deviation of three independent experiments performed in duplicate on hASCs derived from three independent subjects. 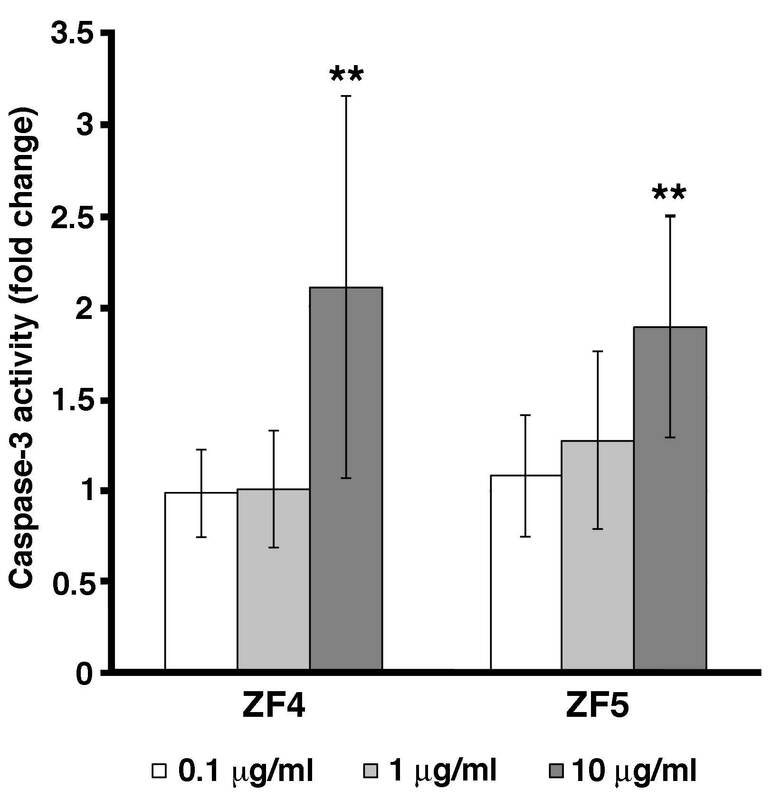 Cell viability is significantly reduced in ZF4 (10 μg/ml), and ZF5 (1 and 10 μg/ml) treated cells compared with control cells after 72 hours. Statistical analysis was determined by one-way ANOVA followed by Dunnett’s post-hoc test (*p < 0.05, **p < 0.01). Figure 2. Caspase-3 activity is induced by late stage developmental extracts. Caspase-3 activity was evaluated in control and exposed cells by ELISA assay. hASCs were treated with ZF4, or ZF5 at the concentrations of 0.1, 1, and 10 μg/ml for 72 hours. Data are presented as ratio of treated cells to control cells (fold change). Caspase-3 activity is significantly increased in both ZF4 (10 μg/ml) and ZF5 (10 μg/ml) treated cells, as compared with control cells (**p < 0.01). Data are expressed as mean ± standard deviation of three independent experiments performed in duplicate on hASCs derived from three independent subjects. Statistical analysis was determined by t-test method. Figure 3. Percentage assessment of apoptotic cells. Apoptosis was evaluated by DAPI staining in control untreated cells and in hASCs that had been treated for 72 hours with ZF4, or ZF5 (10 μg/ml). A and B, Representative images of nuclear morphology in control and treated hASCs, respectively. C, Percentage changes in the amount of apoptotic cells. Data are expressed as mean ± standard deviation of three independent experiments performed in duplicate on hASCs derived from three independent subjects. 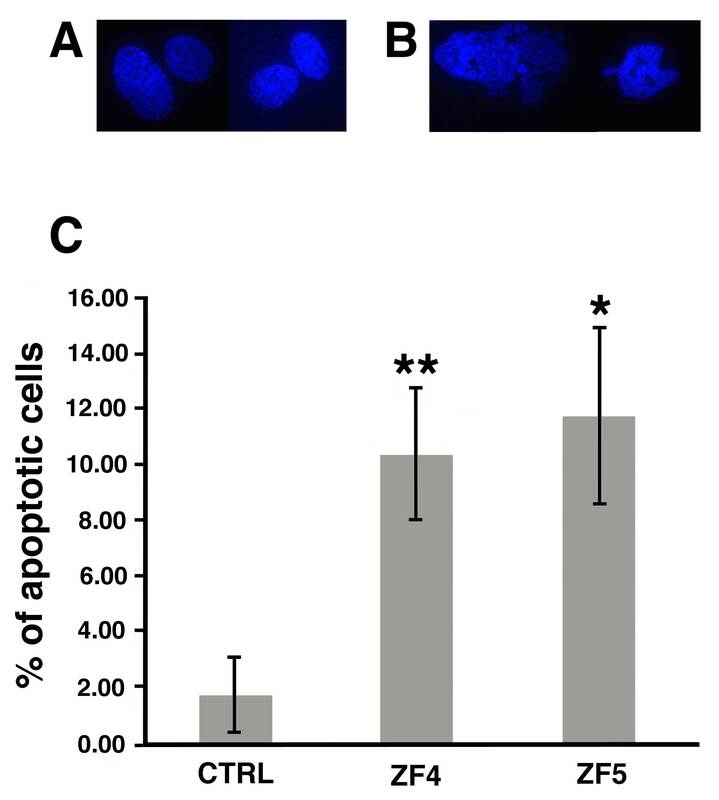 Nuclear morphology highlights a significant increase of apoptosis in all treated cells, as compared with control (CTRL) hASCs (*p < 0.05, **p < 0.01). Statistical analysis was determined by t-test method. Figure 4. Analysis of the effect of early and late developmental stage factors on the gene transcription of apoptotic modulators. The gene expression of Bax or Bcl-2 was evaluated by real-time PCR in controls and hASCs that had been cultured for 72 hours in the presence of 10 μg/ml ZF 1, or ZF5. The amount of Bax (A) or Bcl-2 (B) mRNA from control (CTRL) and treated hASCs (ZF1 or ZF5) was normalized to HPRT1 and was plotted as fold change relative to the mRNA expression of control untreated cells, defined as 1. Data are expressed as mean ± standard deviation of three independent experiments performed in duplicate on hASCs derived from three independent subjects. * Significantly different from the control (p < 0.05). Statistical analysis was determined by t-test method. Figure 5. Early developmental stage extracts enhance the transcription of stemness/pluripotency-related genes. The gene expression of Oct-4 (A), Sox-2 (B) or c-Myc (C) was evaluated by real-time PCR in untreated cells and hASCs exposed for 72 hours to ZF1, or ZF5 (10 μg/ml). The amount of the investigated mRNAs from control (CTRL) and treated hASCs (ZF1 or ZF5) was normalized to HPRT1 and was plotted as fold change relative to the mRNA expression of control untreated cells, defined as 1. Data are expressed as mean ± standard deviation of three independent experiments performed in duplicate on hASCs derived from three independent subjects. Significantly different from the control: *p < 0.05, **p < 0.01. Statistical analysis was determined by t-test method. Figure 6. Early developmental stage factors promote the transcriptional activation of two major antagonists of cell senescence. 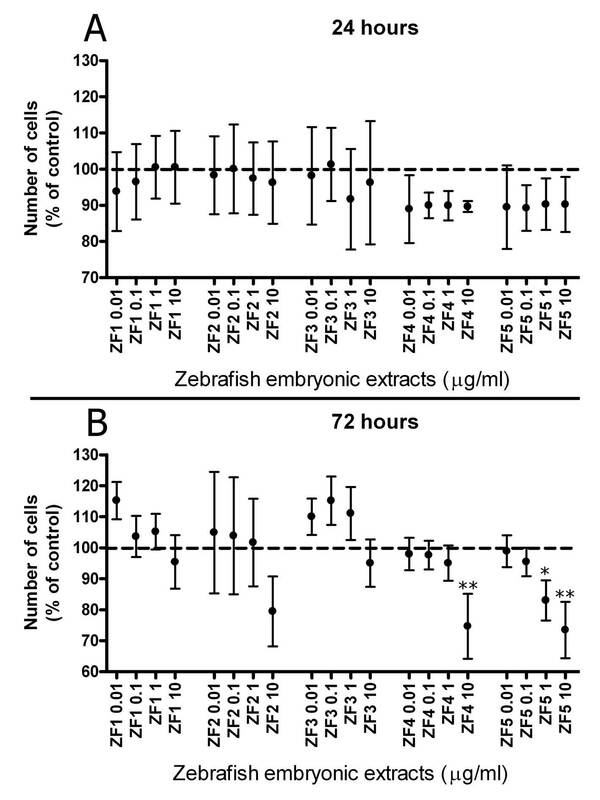 The gene expression of TERT (A) or Bmi-1 (B) was evaluated by real-time PCR in untreated cells and hASCs exposed for 72 hours to ZF 1, or ZF5 (10 μg/ml). The amount of the investigated mRNAs from control (CTRL) and treated hASCs (ZF1 or ZF5) was normalized to HPRT1 and was plotted as fold change relative to the mRNA expression of control untreated cells, defined as 1. Data are expressed as mean ± standard deviation of three independent experiments performed in duplicate on hASCs derived from three independent subjects. Significantly different from the control: *p < 0.05, **p < 0.01. Statistical analysis was determined by t-test method. Pozzoli O, Vella P, Iaffaldano G, Parente V, Devanna P, Lacovich M, Lamia CL, Fascio U, Longoni D, Cotelli F, Capogrossi MC, Pesce M. Endothelial fate and angiogenic properties of human CD34+ progenitor cells in zebrafish. Arterioscler Thromb Vasc Biol 2011; 31: 1589-1597. Biava PM, Bonsignorio D. Cancer and cell differentiation: a model to explain malignancy. J Tumor Marker Oncol 2002; 17: 47-54. Biava PM, Nicolini A, Ferrari P, Carpi A, Sell S. A systemic approach to cancer treatment: tumor cell reprogramming focused on endocrine-related cancers. Curr Med Chem 2014; 21: 1072-1081. Minz B, Illmensee K. Normal genetically mosaic mice produced from malignant teratocarcinoma cells. Proc Natl Acad Sci USA1975; 72: 3585-3589. Papaioannou VE, McBumey MV, Gardner RL, Evans RL. Fate of teratocarcinoma cells injected into early mouse embryos. Nature 1975; 258: 70-73. Pierce GB. The cancer cell and its control by the embryo. Am J Pathol 1983; 113: 116-124. Hendrix MJ, Seftor EA, Seftor REB, Kaisermeier-Kulesa J, Kulesa PM, Postovit LM. Reprogramming metastatic tumor cells with embryonic microenvironment. Nat Rev Cancer 2007; 7: 246-255. Postovit LM, Maragaryan NV, Seftor EA, Kirschmann DA, Lipavski A, Wheaton WW, Abbott DE, Seftor RE, Hendrix MJ. Human embryonic stem cell microenvironment suppress the tumorigenic phenotype of aggressive cancer cells. Proc Natl Acad Sci USA 2008; 18: 105-111. Ohnishi K, Semi K, Yamada Y. Epigenetic regulation leading to induced pluripotency drives cancer development in vivo. Biochem Biophys Res Commun 2014 Jul 11. pii: S0006-291X(14)01234-0. doi: 10.1016/j.bbrc.2014.07.020. [Epub ahead of print]. Ohnishi K, Semi K, Yamamoto T, Shimizu M, Tanaka A, Mitsunaga K, Okita K, Osafune K, Arioka Y, Maeda T, Soejima H, Moriwaki H, Yamanaka S, Woltjen K, Yamada Y. Premature termination of reprogramming in vivo leads to cancer development through altered epigenetic regulation. Cell 2014; 156: 663-677. Biava PM, Bonsignorio D, Hoxa M. Cell proliferation curves of different human tumor lines after in vitro treatment with Zebrafish embryonic extracts. J Tumor Marker Oncol 2001; 16: 195-202. Biava PM, Bonsignorio D, Hoxa M, Facco R, Ielapi T, Frati L, Bizzarri, M. Post-traslational modification of the retinoblastoma protein (pRb) induced by in vitro administration of Zebrafish embryonic extracts on human kidney adenocarcinoma cell line. J Tumor Marker Oncol 2002; 17: 59-64. Cucina A, Biava PM, D’Anselmi F, Coluccia P, Conti F, Di Clemente R, Miccheli A, Frati L, Gulino A, Bizzani M. Zebrafish embryo proteins induce apoptosis in human colon cancer cells (Caco2). Apoptosis 2006; 9: l617-1628. Biava PM, Basevi M, Biggiero L, Borgonovo A, Borgonovo E, Burigana F. Cancer cell reprogramming: stem cell differentiation stage factors and an agent based model to optimize cancer treatment. Curr Pharm Biotechnol 2011; 12: 231-242. Livraghi T, Meloni F, Frosi A, Lazzaroni S, Bizzani M, Frati L, Biava PM. Treatment with stem cell differentiation stage factors of intermediate-advanced hepatocellular carcinoma: an open randomized clinical trial. Oncol Res 2005; 15: 399-408. Bianchi F, Maioli M, Leonardi E, Olivi E, Pasquinelli G, Valente S, Mendez AJ, Ricordi C, Raffaini M, Tremolada C, Ventura C. A new nonenzymatic method and device to obtain a fat tissue derivative highly enriched in pericyte-like elements by mild mechanical forces from human lipoaspirates. Cell Transplant 2013; 22: 2063-2077. Molofsky AV, Pardal R, Iwashita T, Park IK, Clarke MF, Morrison SJ. Bmi-1 dependence distinguishes neural stem cell self-renewal from progenitor proliferation. Nature 2003; 425: 962-967. Guney I, Sedivy JM. Cellular senescence, epigenetic switches and c-Myc. Cell Cycle 2006; 5: 2319-2323. Lessard J, Sauvageau G. Bmi-1 determines the proliferative capacity of normal and leukaemic stem cells. Nature 2003; 423: 255-260. Park IK, Qian D, Kiel M, Becker MW, Pihalja M, Weissman IL, Morrison SJ, Clarke MF. Bmi-1 is required for maintenance of adult self-renewing haematopoietic stem cells. Nature 2003; 423: 302-305. Pfaffl MW. A new mathematical model for relative quantification in real-time RTPCR. Nucleic Acids Res 2001; 29: e45. Kelly PN, Strasser A. The role of Bcl-2 and its pro-survival relatives in tumourigenesis and cancer therapy. Cell Death Differ 2011; 18: 1414-1424. Estrada JC, Torres Y, Benguría A, Dopazo A, Roche E, Carrera-Quintanar L, Pérez RA, Enríquez JA, Torres R, Ramírez JC, Samper E, Bernad A. Human mesenchymal stem cell-replicative senescence and oxidative stress are closely linked to aneuploidy. Cell Death Dis 2013; 4: e691. Izadpanah R, Kaushal D, Kriedt C, Tsien F, Patel B, Dufour J, Bunnell BA. Long-term in vitro expansion alters the biology of adult mesenchymal stem cells. Cancer Res 2008; 68: 4229-4238. Gruber HE, Somayaji S, Riley F, Hoelscher GL, Norton HJ, Ingram J, Hanley EN Jr. Human adipose-derived mesenchymal stem cells: serial passaging, doubling time and cell senescence. Biotech Histochem 2012; 87: 303-311. Han SM, Han SH, Coh YR, Jang G, Chan Ra J, Kang SK, Lee HW, Youn HY. Enhanced proliferation and differentiation of Oct4- and Sox2-overexpressing human adipose tissue mesenchymal stem cells. Exp Mol Med 2014; 46: e101. Conner EA, Teramoto T, Wirth PJ, Kiss A, Garfield S, Thorgeirsson SS. HGF-mediated apoptosis via p53/bax-independent pathway activating JNK1. Carcinogenesis 1999; 20: 583-590. Mullauer FB, Kessler JH, Medema JP. Betulinic acid induces cytochrome c release and apoptosis in a Bax/Bak-independent, permeability transition pore dependent fashion. Apoptosis 2009; 14: 191-202. Lei X, Chen Y, Du G, Yu W, Wang X, Qu H, Xia B, He H, Mao J, Zong W, Liao X, Mehrpour M, Hao X, Chen Q. Gossypol induces Bax/Bak-independent activation of apoptosis and cytochrome c release via a conformational change in Bcl-2. FASEB J 2006; 20: 2147-2149. Wen K, Fu Z, Wu X, Feng J, Chen W, Qian J. Oct-4 is required for an antiapoptotic behavior of chemoresistant colorectal cancer cells enriched for cancer stem cells: effects associated with STAT3/Survivin. Cancer Lett 2013; 333: 56-65. Lin Y, Yang Y, Li W, Chen Q, Li J, Pan X, Zhou L, Liu C, Chen C, He J, Cao H, Yao H, Zheng L, Xu X, Xia Z, Ren J, Xiao L, Li L, Shen B, Zhou H, Wang YJ. Reciprocal regulation of Akt and Oct4 promotes the self-renewal and survival of embryonal carcinoma cells. Mol Cell 2012; 48: 627-640. Thiel G. How Sox2 maintains neural stem cell identity. Biochem J 2013; 450: e1-2. Feng R, Zhou S, Liu Y, Song D, Luan Z, Dai X, Li Y, Tang N, Wen J, Li L. Sox2 protects neural stem cells from apoptosis via up-regulating survivin expression. Biochem J 2013; 450: 459-468. Madonna R, Taylor DA, Geng YJ, De Caterina R, Shelat H, Perin EC, Willerson JT. Transplantation of mesenchymal cells rejuvenated by the overexpression of telomerase and myocardin promotes revascularization and tissue repair in a murine model of hindlimb ischemia. Circ Res 2013; 113: 902-914. Lüscher B, Vervoorts J. Regulation of gene transcription by the oncoprotein MYC. Gene 2012; 494: 145-160. Nie Z, Hu G, Wei G, Cui K, Yamane A, Resch W, Wang R, Green DR, Tessarollo L, Casellas R, Zhao K, Levens D. c-Myc is a universal amplifier of expressed genes in lymphocytes and embryonic stem cells. Cell 2012; 151: 68-79. Sumi T, Tsuneyoshi N, Nakatsuji N, Suemori H. Apoptosis and differentiation of human embryonic stem cells induced by sustained activation of c-Myc. Oncogene 2007; 26: 5564-5576. Lunde K, Belting HG, Driever W. Zebrafish pou5f1/pou2, homolog of mammalian Oct4, functions in the endoderm specification cascade. Curr Biol 2004; 14: 48-55. Onichtchouk D, Geier F, Polok B, Messerschmidt DM, Mössner R, Wendik B, Song S, Taylor V, Timmer J, Driever W. Zebrafish Pou5f1-dependent transcriptional networks in temporal control of early development. Mol Syst Biol 2010; 6: 354. Kotkamp K, Mössner R, Allen A, Onichtchouk D, Driever W. A Pou5f1/Oct4 dependent Klf2a, Klf2b, and Klf17 regulatory sub-network contributes to EVL and ectoderm development during zebrafish embryogenesis. Dev Biol 2014; 385: 433-447. Maioli M, Rinaldi S, Santaniello S, Castagna A, Pigliaru G, Delitala A, Bianchi F, Tremolada C, Fontani V, Ventura C. Radio electric asymmetric conveyed fields and human adipose-derived stem cells obtained with a non-enzymatic method and device: a novel approach to multipotency. Cell Transplant 2013 Aug 30. doi: 10.3727/096368913X672037. [Epub ahead of print]. Bianco P, Riminucci M, Gronthos S, Robey PG. Bone marrow stromal stem cells: nature, biology, and potential applications. Stem Cells 2001; 19: 180-192. Rando TA. Stem cells, ageing and the quest for immortality. Nature 2006; 441: 1080-1086. Itahana K, Zou Y, Itahana Y, Martinez JL, Beausejour C, Jacobs JJ, Van Lohuizen M, Band V, Campisi J, Dimri GP. Control of the replicative life span of human fibroblasts by p16 and the polycomb protein Bmi-1. Mol Cell Biol 2003; 23: 389-401. Klapper W, Parwaresch R, Krupp G. Telomere biology in human aging and aging syndromes. Mech Ageing Dev 2001; 122: 695-712. Herrscher RF, Kaplan MH, Lelsz DL, Das C, Scheuermann R, Tucker PW. The immunoglobulin heavy-chain matrix-associating regions are bound by Bright: a B cell-specific trans-activator that describes a new DNA-binding protein family. Genes Dev 1995; 9: 3067-3082. Wilsker D, Patsialou A, Dallas PB, Moran E. ARID proteins: a diverse family of DNA binding proteins implicated in the control of cell growth, differentiation, and development. Cell Growth Differ 2002; 13: 95-106. Popowski M, Templeton TD, Lee BK, Rhee C, Li H, Miner C, Dekker JD, Orlanski S, Bergman Y, Iyer VR, Webb CF, Tucker H. Bright/Arid3A Acts as a Barrier to Somatic Cell Reprogramming through Direct Regulation of Oct4, Sox2, and Nanog. Stem Cell Reports 2014; 2: 26-35.